The Hoya 77mm EVO Antistatic Circular Polarizer Filter helps to reduce reflections and glare by filtering out light that has become polarized due to reflection from a non-metallic surface. This results in a noticeable increase in the saturation of skies and foliage, as well as clearer imagery when photographing in hazy conditions. A circular polarizer differs from a linear polarizer in that it supports full use of a camera's autofocus and auto exposure functions. Two-piece aluminum filter ring features a low profile to reduce the likelihood of vignetting when used on wide-angle lenses. Additionally, this ring incorporates front 77mm filter threads for stacking additional filters or attaching lens caps. 77mm EVO Antistatic Circular Polarizer Filter is rated 4.5 out of 5 by 6. Rated 5 out of 5 by Steven from This product does exactly what it claims to do Hoya's EVO Antistatic filters are great. They protect my lenses and are soooo easy to clean. It's like dirt just doesn't stick to these filters. They are a nice thin profile, so no vignetting. They are great. Rated 5 out of 5 by Steven from My GO TO Filters These filters are amazing! They have all the protective coatings of the any high quality filter PLUS their Anti-static feature keeps them a lot cleaner and super easy to clean. I highly recommend these filters. Rated 2 out of 5 by Steve from Big problem! I received this filter today for use on my new 5D MkIII on which I had a B&W e-Pro UV filter. Just to check the fit, it placed the filter over the UV filter but DID NOT tighten up. When I went to remove it, I could not do so! Would not budge on iota. After trying everything I could think of, I found a tool I had that could grab the edge of the static part of the polarizer filter and nudge it loose. Nothing obvious wrong in examining it. Since I am leaving on a trip, I cannot return it yet but will plan to when I return for a replacement. Of course, I cannot tell if it is the B&W or the Hoya filtr that is the problem. Will certainly use the utmost care when placing this filter over the lens and will not tighten it at all. Were it not for this problem, I expect the rating would have been significantly higher. Rated 5 out of 5 by Anonymous from Works as advertised Use it for landscape photos, works great for what it's for. Rated 5 out of 5 by Angel R. from Nicely build Great product to of the line. Use in my Tokina wide lens. I'm very satisfied with this accessory. Rated 5 out of 5 by Fototeatro from Excelente producto Cumplio todas las expectativas que tenia. 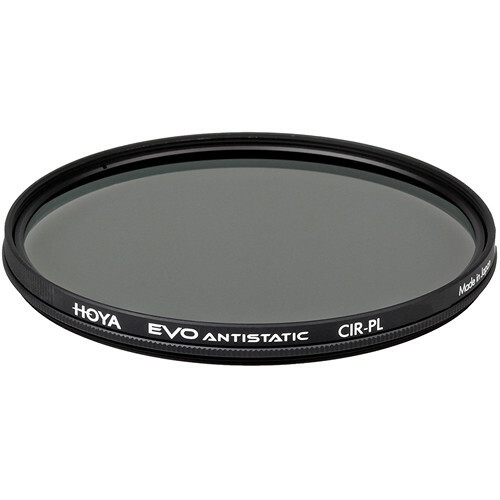 What's the difference between the Hoya EVO line and FUSION line of circular polarizers? This is very confusing. The EVO series are designed for sale in the US markets, while the Fusion line is sold outside the US. There is no difference between the two filter lines physically.